Product information "Skirting board Vinyl 00123 19 x 58 x 2400 mm"
This 19 / 58 format skirting is available is a vast range of colours. This medium height skirting has a high-quality MDF base and a slanted design with a straight upper edge. It can be used anywhere and fits comfortably into any living space. Cable with a maximum diameter of 6 mm can be laid in the integral cable channel on the reverse. 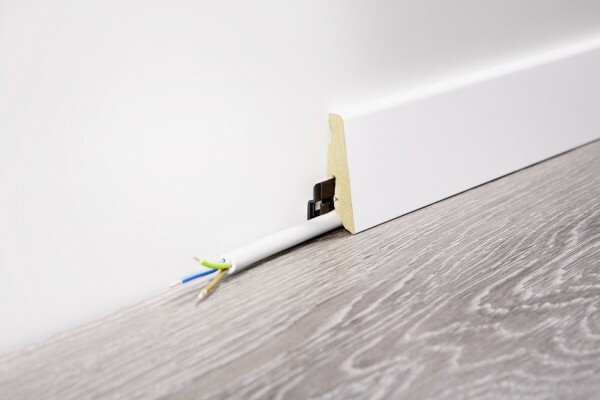 This skirting is easy to install and remove using the wineo Clipholder fastening system and can also be screwed, nailed or glued in place.